GRP Door surround available in two designs and two colours simple to install and very effective. GRP Roof, supplied complete with pilers this will add a touch of class to the front of your house, simply to install. Georgian Door Surround A beautiful surround, the Georgian features are sharp and clear cut. Pillars available at 2100 high and 2300 high. Alternatively, this surround comes in custom sizes. These attractive pillars and canopies can be made to fit around your door. Complete as ..
A beautiful surround, the Georgian features are sharp and clear cut. Pillars available at 2100 high and 2300 high. The top lintel can also be stretched to a max 3000 mm size. Alternatively, this surround comes in custom sizes. These attractive pillars and canopies can be made to fit around your door..
Our standard Victorian style Door surround will transform any doorway. Beautifully moulded from rigid GRP, and incorporating a rose design centre piece in the overdoor canopy, this maintenance free door surround will give years of service.Fast, easy installation means that you can have an entranc.. 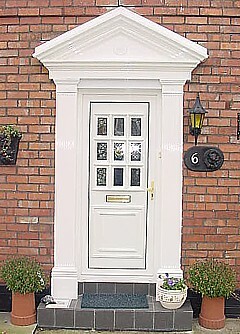 Custom-made door surrounds can be made to your own specifications using our detailed GRP fascia. This can be fabricated to fit around any door opening- garage doors and even shop fronts to enhance their appearance- giving a high quality maintenance-free surround. These create a good looking frontage..